Home DIY Projects	Twin Beds in a Small Room! Happy Tuesday, Friends! As my husband is working on remodeling the front entry of our lake house, I thought I’d share with you a few rooms we’ve remodeled thus far at Happy Hill. (aka our lake house) Today I’ll share our Bunkhouse. Come see how we fit twin beds in a small room! My husband, Brad, and I bought our lake house in February 2012. We discovered a stone placard under the house on the foundation that read, “Happy Hill” 1970-71. JWE was the original owner and builder. We affectionately refer to him as Mr. E. I love it when people add a personal touch when building a house. It becomes and stays part of its story. We feel like the name Happy Hill is absolutely perfect and we’ve called it that ever since. We even had a customized life ring made to go on the back of the house. While it is an authentic life buoy, it’s more for decoration but there if we ever need it. Now, the house is nearly 50 years old and starting to show its age. We remodeled the entire interior of the house, including the kitchen and bathrooms. The exterior of the house got a much-needed paint job, but now the deck and front porch roof are rotted and deteriorating quickly. So, the front of the house is being torn down and a new one will take its place. I’ll share more of this project later, and how we hope the new front of the house will look. On the left is the original roof and on the right after my husband removed it. Baby steps. We painted the concrete floors in the entire basement and painted all of the walls and ceilings. 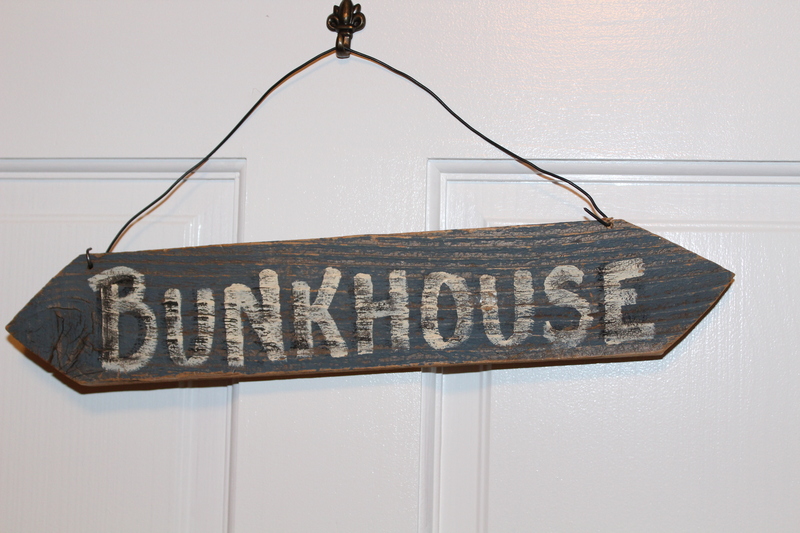 Without the closet full of old furnace parts, we actually had room for 2 twin beds and dubbed the room, “The Bunkhouse.” I found this sweet little sign at an antique store and it now hangs on the door. I inherited these antique iron beds from my Great-Grandfather on my Dad’s side. I had them in my room growing up. My Mother painted one red and one blue. (She was the one who taught me that a little paint and elbow grease can completely transform furniture! Thanks, Mom, you created a monster!) Both of my sisters used them for their children and when we bought the lake house, I got them back. The original rails were a little wonky from years of use, so I had my welder reinforce all of the rails and joints. I gave them a few coats of black paint and they fit the room perfectly! Now they are ready for at least 100 more years of sweet dreams! This little Bunkhouse makes me so happy. I love the history behind the beds and I think Mr. E would be pleased with how we reimagined his little lake house without tearing it down! For the light fixture in the Bunkhouse, I bought this fun nautical light on eBay. The fixture was missing a piece in the middle so I found a small metal anchor and painted it red to match the base of the light. The compass shade and the little anchor give the room a fun nautical vibe, as well as nice light. It holds 3 bulbs. This tiny room goes to show you don’t need a lot of square footage for a bedroom. After all, when you are at the lake, all you do is sleep in a bedroom! The rest of the time folks are out on the deck, patio or on the boat! This house is still a work in progress, but each summer we enjoy quality time with our children and families. My family and my husband’s family (unwittingly) grew up on this same lake. One day we hope there will be a pitter-patter of tiny feet and the Brooks/Barton lake tradition will live on!